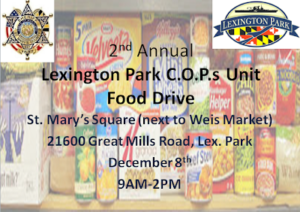 The Lexington Park Community Oriented Policing (COPs) Unit is hosting its Second Annual Food Drive on Saturday, Dec. 8, 2018 from 9 a.m. to 2 p.m. in St. Mary’s Square between Ollie’s and Weis Market in Lexington Park. Along with collecting non-perishable food items for the Lexington Park food pantries, the COPs Unit will also be collecting donations of baby food, diapers and wipes for the Pregnancy Care Center of Southern Maryland. Email Cpl. Timothy Snyder at timothy.snyder@stmarysmd.com for additional information. This entry was posted on December 3, 2018 at 8:49 am and is filed under All News, Community, County, St. Mary's News, Top News, z 600X120 Top Ad Bottom, z 600X120 Top Ad Top. You can follow any responses to this entry through the RSS 2.0 feed. They need jail, not food. You’re an idiot! Maybe you need jail time instead of food, clothing and a place to live.